This walk begins where the old and new main lines meet at Factory Junction in Tipton and takes you through the heart of the Black Country. The start is inauspicious but, just past Factory Bridge (this modern effort supercedes Telford's 1825 cast iron structure and Brindley's original brick arch), the towpath passes the former entrance to a GWR / canal interchange. The site is now industrial units but was also the location of James Keir's soap factory that gave the locks and bridge their name. Keir, a Scot like his partner Alexander Blair and friend James Watt, set up the alkali and soap works in about 1780, it closed in 1842. The well travelled Keir, was an industrialist who had many other interests including metallurgy and glass making, for which his factory made lead compounds, and was another influential member of the Lunar Society. A third of a mile further on, a kink in the canal marks Bloomfield Junction, formerly at the southern end of the Wednesbury Oak Loop that circumnavigated Coseley Hill and served mines and major ironworks including Bloomfields, famous for wrought iron, and 'Iron Mad' Wilkinson's Bradley works. The landscape now becomes surprisingly pleasant and soon the southern end of the Coseley Tunnel is reached. It's not a long tunnel (360yds) but exemplifies Telford's quest for a straighter and shorter main line. Designed to have a tow path on both sides, Telford died before its completion.in 1837. Continuing through unspectacular yet well kept housing estates, above Hills Bridge you may notice a 'Welcome to Wolverhampton' sign. After Anchor Bridge and before the rather large bridge with rather large graffiti carrying the Black Country Route, there's Deepfields Junction at the other end of the Wednesbury Oak Loop. No longer adjacent to the railway after Turton Croft Bridge, the far side of the canal is covered by factories while the tow path side has what appears to be a nature reserve although all the information signs, except one warning of snakes that bite, have been stolen. The canal now curves to Spring Vale Rail Bridge where there are still indications of a basin serving Bilston Steel Works on the tow path side with other basins on the far side. Spring Vale may conjure up visons of wild flower meadows but on the other side of the railway bridge would have been the vast Bilston Steel Works containing Elisabeth, the last blast furnace in the Black Country, on a site that had been producing iron from the late 17th century to 1979. A major contributor to the Black Country's 'black by day, red by night' epithet, it is now another housing estate. Between Millfields Bridge and Jibbet Lane Bridge stood the Bilston Gas Works. The canal is largely free of rubbish, due in no small measure to the sterling efforts of Community Service Pay Back 'volunteers'. There's new housing developments on the tow path side opposite the magnificently large former Ettingshall Boiler Works and industry prevails much more on the way to the Rough Hill Gauging Station and Catchems Corner Bridge. After Bilston Road you'll have the privilege of coming across the derelict Chillington Basin. Built to serve the ironworks of the same name, it was later acquired by the LNWR, rebuilt and became the Monmore Green Interchange Depot in 1902. Originally one basin, a second basin was added c.1850 but filled in by the LMS railway in the 1930s when the crane was put in place. Grade II listed and the only surviving canal / railway interchange on the Main Line, its Babcock and Wilcox travelling crane was surprisingly still operating up until 2000. Further on, a BOC depot has gas cylinders lined up as far as the eye can see and opposite is the impressive building that housed Wolverhampton's first power station. After Walsall Street Bridge, Pickfords Wharf was on the other side of the canal which had fly boats to many destinations operating day and night, and further on there's the site of the former Minerva Iron and Steel works. 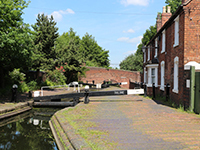 The 'curly wyrley' Wyrley and Essington canal joined at Horseley Fields Junction in 1797. Just over a quarter of a mile past this junction, you'll see the former Cheese and Butter Warehouse and Albion Mill, which would have been part of a collection of wharfs, mills and warehouses, including Albion Wharf from where Fellows, Morton and Clayton operated and Union Mill which was demolished after a fire in 1989. The original line of the canal would have deviated to the right just before Corn Hill, gone through what was to become the High Level Station and 're-joined' the current line just before Broad Street at what would become Shropshire Union Wharf and is now Broad Street Basin. The building of the station, which opened in 1852, necessitated this diversion. Instead of the colossal amount of industry that once blanketed the area, modern apartments now line the tow path before the Wolverhampton Tunnel, a very impressive brick lined edifice. Can Lane Wharf and Basin would have been at the far end of the tunnel together with timber yards and the Swift Packet Company who conveyed passengers to Birmingham at a breakneck 10mph until the Stour Valley Railway arrived. All this infrastructure is now buried under the Ring Road. However, just before Broad Street Basin, with its Grade II listed footbridge and FMC branded night club, look high to the left and you'll see the wonderful Chubb building. On the far side of Broad Street there are pleasant moorings, a far cry from when Hay Basin & Wharf and the Union Inn occupied the landscaped gardens with Shelton's Saw Mill on the other side of the canal. Further on, opposite the entrance to Victoria Basin (built by the Shrewsbury & Birmingham Railway Company as a canal interchange) there's the listed late 18th century BCN lock cottages, a long disused boatman's mission, and the first of 21 Wolverhampton Locks (Initially Brindley was thinking of installing 40 locks to conserve water) that descend 132ft to Alderley Junction. As you pass lock 1 the canal would have increasingly become the jam in a GWR / LNWR sandwich. Canalside industries included the Junction Iron Works with a basin between locks 1 and 2, and Davies Brothers' Crown Works (lock 6) that produced some of the world's first hot dip galvanized metal. Next door was the Ceres Works which manufactured artificial manure and sulphuric acid from animal waste, the loading bays are still visible. The rank air was made even more unpleasant by the corporation's sewage works a little further on where a refuse incinerator now stands. Before lock 12 you go under two girder bridges and the Stour Valley viaduct that carries the main rail line from Wolverhampton to the north. The air wouldn't have got any better as the former gas works straddled the canal between locks 12 and 15, relying on the canal for both the delivery of coal and disposal of thousands of tons of coal gas tar which, until the mid-60s, was taken away by Thomas Clayton boats. These would have reversed from lock 9 so they faced the correct way to take their load to various Black Country tar works. The former basin can still be seen and part of the gas works is now a science park. One little known fact is that In September 1862, this was the scene for the world record balloon ascent without oxygen. Flying high on coal gas the balloon reached a record height of 37,000 feet before one of the aviators passed out. The impressively engineered Oxley viaduct crosses before lock 16, you then walk along the longest pound to lock 17 and, at lock 18, Wolverhampton Race Course is on the left where it relocated in 1887. The only West Midlands track and perhaps the UK's busiest. To begin with there were only 20 locks, but the current lock 21 proved too deep and slow to fill, so lock 20 was installed to solve the problem and save water, you'll notice that unlike the others it only has a single gate at each end. Believe it or not, Wolverhampton Locks is now a pleasant and quite green walk with railway tracks replaced by wildlife rich parkland. There's always the added interest of the area's industrial heritage but by the time you reach the bottom lock, the atmosphere at Aldersley Junction is positively bucolic. This is the summit of the Staffs and Worcester Canal with the Severn to the south and the Trent in the opposite direction. The Main Line arrived here in 1772 and the remains of a collection of buildings that would have included stables, a toll office that stood on the south side of the bridge and a wharf can still just be discerned, dating from when this was a very different scene.